1685 painting of Constantine issued for king James VII's restoration of Holyrood Palace, located in the Great Painting Room in Holyrood Palace. Causantín or Constantín mac Cináeda (in Modern Gaelic: Còiseam mac Choinnich; died 877) was a king of the Picts. He is often known as Constantine I in reference to his place in modern lists of kings of Scots, but contemporary sources described Causantín only as a Pictish king. A son of Cináed mac Ailpín ("Kenneth MacAlpin"), he succeeded his uncle Domnall mac Ailpín as Pictish king following the latter's death on 13 April 862. It is likely that Causantín's (Constantine I) reign witnessed increased activity by Vikings, based in Ireland, Northumbria and northern Britain. He died fighting one such invasion. Very few records of ninth century events in northern Britain survive. The main local source from the period is the Chronicle of the Kings of Alba, a list of kings from Cináed mac Ailpín (died 858) to Cináed mac Maíl Coluim (died 995). The list survives in the Poppleton Manuscript, a thirteenth-century compilation. Originally simply a list of kings with reign lengths, the other details contained in the Poppleton Manuscript version were added from the tenth century onwards. In addition to this, later king lists survive. 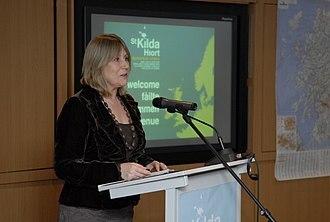 The earliest genealogical records of the descendants of Cináed mac Ailpín may date from the end of the tenth century, but their value lies more in their context, and the information they provide about the interests of those for whom they were compiled, than in the unreliable claims they contain. The Pictish king-lists originally ended with this Causantín, who was reckoned the seventieth and last king of the Picts. For narrative history the principal sources are the Anglo-Saxon Chronicle and the Irish annals. 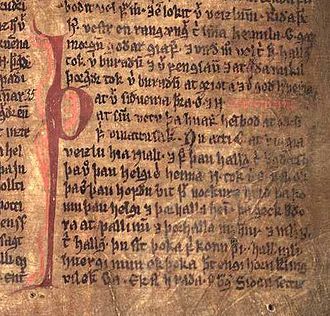 While Scandinavian sagas describe events in 9th century Britain, their value as sources of historical narrative, rather than documents of social history, is disputed. If the sources for north-eastern Britain, the lands of the kingdom of Northumbria and the former Pictland, are limited and late, those for the areas on the Irish Sea and Atlantic coasts—the modern regions of north-west England and all of northern and western Scotland—are non-existent, and archaeology and toponymy are of primary importance. Writing a century before Causantín was born, Bede recorded five languages in Britain. 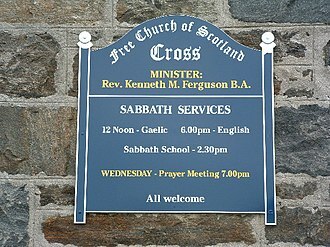 Latin, the common language of the church; Old English, the language of the Angles and Saxons; Irish, spoken on the western coasts of Britain and in Ireland; Brythonic, ancestor of the Welsh language, spoken in large parts of western Britain; and Pictish, spoken in northern Britain. By the ninth century a sixth language, Old Norse, had arrived with the Vikings. Viking activity in northern Britain appears to have reached a peak during Causantín's reign. Viking armies were led by a small group of men who may have been kinsmen. 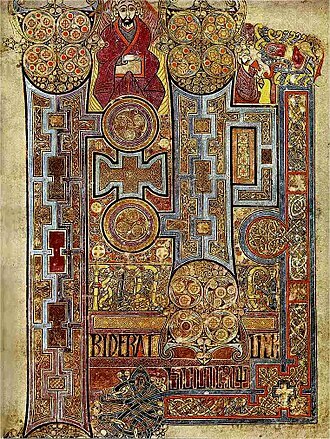 Among those noted by the Irish annals, the Chronicle of the Kings of Alba and the Anglo-Saxon Chronicle are Ívarr—Ímar in Irish sources—who was active from East Anglia to Ireland, Halfdán—Albdann in Irish, Healfdene in Old English— and Amlaíb or Óláfr. As well as these leaders, various others related to them appear in the surviving record. Viking activity in Britain increased in 865 when the Great Heathen Army, probably a part of the forces which had been active in Francia, landed in East Anglia. The following year, having obtained tribute from the East Anglian King Edmund, the Great Army moved north, seizing York, chief city of the Northumbrians. The Great Army defeated an attack on York by the two rivals for the Northumbrian throne, Osberht and Ælla, who had put aside their differences in the face of a common enemy. Both would-be kings were killed in the failed assault, probably on 21 March 867. Following this, the leaders of the Great Army are said to have installed one Ecgberht as king of the Northumbrians. 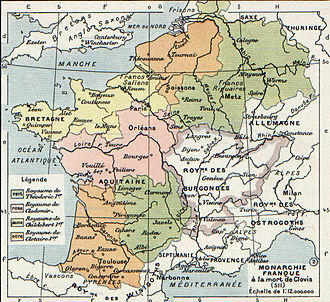 Their next target was Mercia where King Burgred, aided by his brother-in-law King Æthelred of Wessex, drove them off. While the kingdoms of East Anglia, Mercia and Northumbria were under attack, other Viking armies were active in the far north. Amlaíb and Auisle (Ásl or Auðgísl), said to be his brother, brought an army to Fortriu and obtained tribute and hostages in 866. 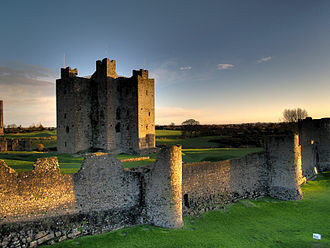 Historians disagree as to whether the army returned to Ireland in 866, 867 or even in 869. Late sources of uncertain reliability state that Auisle was killed by Amlaíb in 867 in a dispute over Amlaíb's wife, the daughter of Cináed. It is unclear whether, if accurate, this woman should be identified as a daughter of Cináed mac Ailpín, and thus Causantín's sister, or as a daughter of Cináed mac Conaing, king of Brega. While Amlaíb and Auisle were in north Britain, the Annals of Ulster record that Áed Findliath, High King of Ireland, took advantage of their absence to destroy the longphorts along the northern coasts of Ireland. Áed Findliath was married to Causantín's sister Máel Muire. She later married Áed's successor Flann Sinna. Her death is recorded in 913. In 870, Amlaíb and Ívarr attacked Dumbarton Rock, where the River Leven meets the River Clyde, the chief place of the kingdom of Alt Clut, south-western neighbour of Pictland. The siege lasted four months before the fortress fell to the Vikings who returned to Ireland with many prisoners, "Angles, Britons and Picts", in 871. Archaeological evidence suggests that Dumbarton Rock was largely abandoned and that Govan replaced it as the chief place of the kingdom of Strathclyde, as Alt Clut was later known. King Artgal of Alt Clut did not long survive these events, being killed "at the instigation" of Causantín son of Cináed two years later. Artgal's son and successor Run was married to a sister of Causantín. Amlaíb disappears from Irish annals after his return to Ireland in 871. According to the Chronicle of the Kings of Alba he was killed by Causantín either in 871 or 872 when he returned to Pictland to collect further tribute. His ally Ívarr died in 873. In 875, the Chronicle and the Annals of Ulster again report a Viking army in Pictland. A battle, fought near Dollar, was a heavy defeat for the Picts; the Annals of Ulster say that "a great slaughter of the Picts resulted". In 877, shortly after building a new church for the Culdees at St Andrews, Causantín was captured and executed (or perhaps killed in battle) after defending against Viking raiders. Although there is agreement on the time and general manner of his death, it is not clear where this happened. Some believe he was beheaded on a Fife beach, following a battle at Fife Ness, near Crail. William Forbes Skene reads the Chronicle as placing Causantín's death at Inverdovat (by Newport-on-Tay), which appears to match the Prophecy of Berchán. The account in the Chronicle of Melrose names the place as the "Black Cave," and John of Fordun calls it the "Black Den". 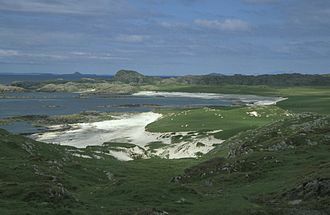 Causantín was buried on Iona. 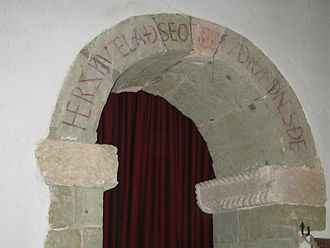 Causantín's son Domnall and his descendants represented the main line of the kings of Alba and later Scotland. ^ Anderson, Kings and Kingship, reproduces these lists and discusses their origins, further discussed by Broun, Irish origins. ^ Downham, Higham, Keynes, O Corrain, Smyth, Woolf. ^ Downham, O Corrain, Smyth, Woolf, AU 866.1. ^ Woolf, AU 913.1, Byrne p. 857, poss. same as Amlaíb's wife. ^ AU 870.6, AU 871.2, Woolf, Downham, Smyth. ^ AU 872.5, Smyth, Woolf. ^ Raymond Lamont-Brown, St Andrews: City by the Northern Sea (Edinburgh: Berlinn, 2006), 9. The Kingdom of Northumbria was a medieval Anglian kingdom in what is now northern England and south-east Scotland, which subsequently became an earldom in a unified English kingdom. The name reflects the southern limit to the kingdoms territory. Northumbria was formed by Æthelfrith in central Great Britain in Anglo-Saxon times, at the beginning of the 7th century, the two kingdoms of Bernicia and Deira were unified. At its height, the kingdom extended at least from just south of the Humber to the River Mersey, the earldom came about when the southern part of Northumbria was lost to the Danelaw. The earldom was bounded by the River Tees in the south, much of this land was debated between England and Scotland, but the Earldom of Northumbria was eventually recognised as part of England by the Anglo-Scottish Treaty of York in 1237. On the northern border, Berwick-upon-Tweed, which is north of the Tweed but had changed many times, was defined as subject to the laws of England by the Wales. The local Environment Agency office, located in Newcastle Business Park, the term is not the official name for the UK and EU region of North East England. See also, List of monarchs of Northumbria and Timeline of Northumbria Northumbria was originally formed from the union of two independent kingdoms and Deira, Bernicia covered lands north of the Tees, while Deira corresponded roughly to modern-day Yorkshire. 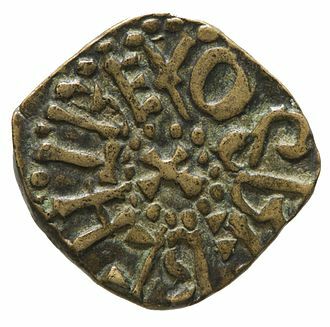 Bernicia and Deira were first united by Aethelfrith, a king of Bernicia who conquered Deira around the year 604. He was defeated and killed around the year 616 in battle at the River Idle by Raedwald of East Anglia, who installed Edwin, the son of Ælla, a former king of Deira, as king. Edwin, who accepted Christianity in 627, soon grew to become the most powerful king in England, he was recognised as Bretwalda and conquered the Isle of Man and Gwynedd in northern Wales. He was, himself defeated by an alliance of the king of Gwynedd, Cadwallon ap Cadfan. After Edwins death, Northumbria was split between Bernicia, where Eanfrith, a son of Aethelfrith, took power, and Deira, cumbria tended to remain a country frontier with the Britons. Both of these rulers were killed during the year that followed, after the murder of Eanfrith, his brother, backed by warriors sent by Domnall Brecc of Dál Riata and killed Cadwallon at the Battle of Heavenfield in 634. Since the late 8th century, the Vikings had settled for mainly hit-and-run raids on centres of wealth, such as monasteries. However, the intent of the Great Army was different and it was much larger than the usual raiding party and its purpose was to conquer. 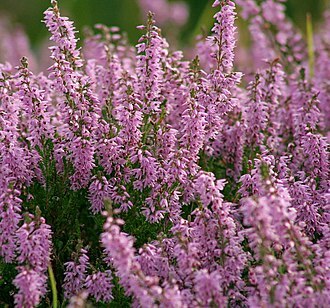 The name Great Heathen Army is derived from the Anglo-Saxon Chronicle of 865, legend has it that the force was led by three sons of Ragnar Lodbrok. The campaign of invasion and conquest against the four remaining Anglo-Saxon kingdoms lasted 14 years, unlike many of the Scandinavian raiding armies of the period, surviving sources give no firm indication of its numbers, but it was clearly amongst the largest forces of its kind. The invaders initially landed in East Anglia, where the king provided them with horses for their campaign in return for peace and they spent the winter of 865–66 at Thetford, before marching north to capture York in November 866. 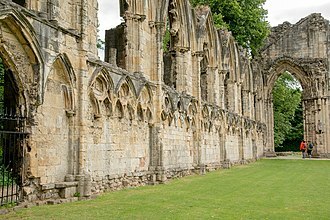 York had been founded as the Roman legionary fortress of Eboracum, during 868, the army marched deep into Mercia and wintered in Nottingham, where it was besieged by a joint force from the kingdoms of Mercia and Wessex. With no progress being made, the Mercians agreed to terms with the Viking army, in 870, the Great Army returned to East Anglia, conquering it and killing its king. The army moved to quarters in Thetford. In 871, the Vikings moved on to Wessex, where Alfred the Great was content to pay them to leave, the army marched to London to overwinter in 872 before moving back to Northumbria in 873. It again returned to Mercia, conquering it in 874 and overwintering at Repton on the River Trent, by this time, only the kingdom of Wessex had not been conquered by the invading Vikings. It was towards the end of 875 when the army started their invasion of Wessex. Viking raids began in England in the late 8th century, primarily on monasteries, the first monastery to be raided was in 793 at Lindisfarne, off the northeast coast, the Anglo-Saxon Chronicle described the Vikings as heathen men. Monasteries and minster churches were popular targets as they were wealthy and had valuable objects that were portable, the Anglo-Saxon Chronicle for the year 840 says that Æthelwulf of Wessex was defeated at Carhampton, after 35 Viking ships had landed in the area. Pearce Statue and Lyceum Theatre, 1904. Arthgal's title as it appears on folio 25v of Oxford Bodleian Library Rawlinson B 489 (the Annals of Ulster). The fortress of Alt Clut occupied Alt Clut ("the rock of the Clyde"). The mediaeval citadel that sat atop this geological formation formed the capital of the Kingdom of Alt Clut before it was captured and destroyed by Amlaíb and Ímar. The name and title of Arthgal's adversary Amlaíb as it appears on folio 25r Oxford Bodleian Library Rawlinson B 489. The Viking kings of Dublin were accorded the Gaelic title rí Gall ("king of the Foreigners"). The names of Amlaíb and Ímar, two Irish-based Viking kings, as they appear on folio 25v of Oxford Bodleian Library Rawlinson B 489 (the Annals of Ulster). The early mediaeval Jordanhill Cross, an example of the so-called 'Govan School' of sculpture that incorporates Celtic and Scandinavian artistry. Several dozen stone monuments make up this collection, perhaps the most significant assemblage of Viking Age sculpture in Britain. The Ardagh Chalice, perhaps a royal ministerial chalice for a 9th-century Irish king. Coin issued during Burgred's reign.